We are featured in the May 2010 issue of The Rotarian, Rotary International‘s magazine. 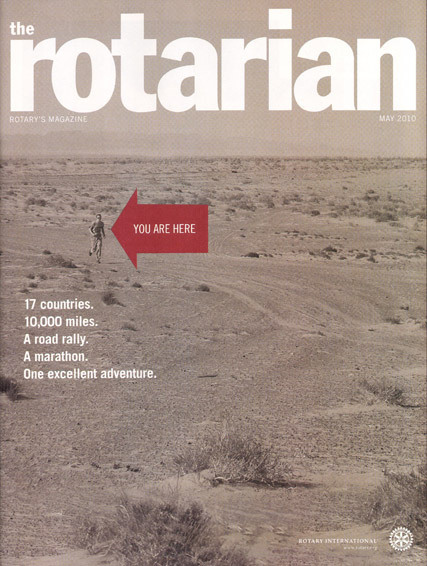 Not only did we receive a massive 18-page feature, but that is Scott on the cover of the magazine, running in the Gobi Marathon. You can read the entire thing in Adobe PDF format by clicking here. We awoke around 6:30 and had a big breakfast together in the restaurant ger. After that we prepared ourselves by getting into our race gear (which for me consisted of putting on my normal clothing and hiking shoes), slathering sunscreen over any exposed flesh, and doing a bit of stretching before getting into the minivans that would take us to the start point some 27 miles away. I woke up early Friday morning to get ready for the trip. Brigitte was heading out in a separate group, so I would be traveling without her for most of the journey. I met up with the other “bus’ers” around 11:30AM near the MIAT Airlines office. There was a French (now American) lady and her elderly mother, a British (now a New Zealander) lady, a German lady, and I, along with our driver and guide, who were both Mongolian. We introduced ourselves and then headed to the State Department store to get supplies if we needed anything. Scott: I do not disagree! In the summer of 2009, two guys from Metro Detroit traveled 10,000 miles from London to Ulaanbaatar, Mongolia in an effort to raise money to assist underprivileged Mongolian families in becoming self-sufficient. Copyright © 2008-2010 mSeven Media, Inc. Please ask before using any images or copy from this site, thanks.